There are a million supplements out there, but which ones are right for you when you're trying to gain mass? Every lifter is different, but these three supps have helped a lot of people get big the right way. When you're after mass gains, there can be a tendency to want to do more of everything: lift until you can't move, eat until you're sick, take every supplement you can afford. After all, you want to make the most of this precious growth time, right? Sure…within reason. And when it comes to supplements, if you're spending money on crazy mass gainers that you could be spending on, well, food, you're barking up the wrong tree. If you're looking to gain mass—without adding extra fat—focus on the big hitters. These three supps can make your workouts more effective, help you recover faster, and keep your body from breaking down as much muscle tissue. That's a great 1-2-3 punch for bodybuilders who want to pack on more muscle! Creatine is primarily stored in your muscles where one of its most important roles is to rapidly generate ATP (adenosine triphosphate), your body's cellular source of energy. Unfortunately, your body can store only small amounts of ATP, and the little it can store gets quickly used up to fuel bursts of high-intensity energy. By supplementing with creatine, you can increase the amount of creatine available to your muscles. When your body has a good supply of creatine, the supplement can help produce more ATP, which helps you train harder for longer, especially when you're performing high-intensity exercise. That can translate into more reps at a given weight, or faster speed and recovery between sets. The amount of creatine you should consume every day depends on your goals. If you're not in a big hurry, you can consume 3-5 grams per day and slowly build up the amount of creatine stored within your muscles. If your goal is to see rapid mass gain, you can start out with a "loading" dose of 5-7 grams of creatine five times a day for 5-7 days, then scale down to 5-7 grams once a day to maintain your level of stored creatine. Both protocols are thought to be equally effective in the long term. Just be aware that when you're loading up on creatine you may experience noticeable water-weight gain in the first 1-4 weeks. Some physique athletes compromise by skipping the loading phase and instead consume 5-10 grams per day over the long haul. Some people swear that the only way to gain mass is to eat a ton of carbohydrates, but the bodybuilding and physique world has long known that you can't pack on quality lean muscle mass without consuming a lot of high-quality protein. And when it comes to that kind of protein, whey protein is king. Whey protein is an extremely fast-digesting, bioavailable form of protein. It has been repeatedly shown to outperform other proteins including casein, soy, and even beef when it comes to stimulating or amplifying muscle hypertrophy. To get the full benefits of whey protein, consume at least 20-30 grams at least once a day, and possibly twice, during a dedicated mass-gaining phase. On the days that you train, consume at least one of your doses post-workout when your body's ability to synthesize protein is high. Researchers at the University of Toronto found that consuming 25 grams of whey immediately post-workout resulted in a 67-69 percent greater protein retention than consuming carbs. The researchers also reported that whey post-exercise provided 53-70 percent better exercise recovery than carbs post-workout. Simply getting enough protein can do a lot to help you turn hard training in to serious gains. However, research seems to indicate that the more well-trained you are, the more frequently your body cycles between periods of being significantly anabolic (growing muscle) and catabolic (breaking down muscle). Timing these anabolic peaks with the ingestion of protein rich in all of the essential amino acids (EAAs) can give your muscles the extra boost they need to grow. Sure, some bodybuilders can achieve this goal by consuming grilled chicken breast and whey protein shakes all day long, but with a certain downside. Food and whey reduce hunger, and no matter how much you know you should, it's often difficult to force another thick shake down your throat. Essential amino acids, on the other hand, can be consumed more or less like water. Plus, more research is showing that amino acids or protein consumed pre-workout can amplify your anabolic response to exercise. Here again, a thick vanilla protein shake, no matter how great tasting it may be or how good it may be for you, sometimes just doesn't sit well and can make you more focused on your bloated stomach than on your workout. This is where supplemental amino acids come in. The EAAs are nine nitrogen-providing compounds that your body needs to get from nutritional sources, because it can't make them on its own. Three of those nine—the most essential, if it helps to think that way—are the branched-chain amino acids (BCAAs) of leucine, isoleucine, and valine. These three have a significant effect on insulin and glucose utilization within muscle, and leucine in particular is thought to be the most effective at stimulating muscle protein synthesis. So why not just pound supplemental leucine? 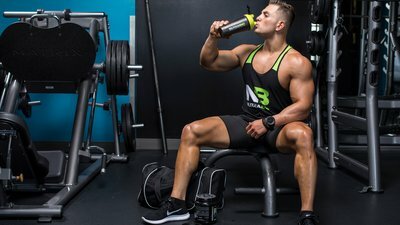 Though branched-chain amino acids and leucine do appear to explain a lot of the anabolic response to protein, a recent study out of Sweden showed that EAAs beat both BCAAs and leucine in stimulating muscle protein synthesis pathways in the first 90 minutes following exercise and supplementation. In fact, EAAs were 18 percent more effective than BCAAs at activating the crucial anabolic mechanism known as the mTOR pathway within the first 90 minutes of recovery, and remained about 40 percent more effective than leucine after 180 minutes. Consume an EAA drink that provides at least 1.8-3.0 grams of leucine, and about 0.9-1.5 grams each of isoleucine and valine per serving. Drink at least one EAA supplement prior to or during workouts, then sip on an EAA drink occasionally throughout the day or between meals to support muscle growth. Hulmi, J. J., Lockwood, C. M., & Stout, J. R. (2010). Effect of protein/essential amino acids and resistance training on skeletal muscle hypertrophy: A case for whey protein. Nutrition & Metabolism, 7(1), 51. West, D. W., Abou Sawan, S., Mazzulla, M., Williamson, E., & Moore, D. R. (2017). Whey Protein Supplementation Enhances Whole Body Protein Metabolism and Performance Recovery after Resistance Exercise: A Double-Blind Crossover Study. Nutrients, 9(7), 735. Newsholme, E. A. (1987). Amino acids, brain neurotransmitters and a functional link between muscle and brain that is important in sustained exercise. Advances in Myochemistry.